Yes, here we are in Jonestown, PA at our favorite place...DQ. opening his truck door, he muttered, Nwhat kind of Blizzard do you want?" And the Pres came out with this.....because we just heard Brian Williams tell his followers...I mean viewers...that chocolate is GOOD for you! Don't ya just love when they will go in and get the goods and you can just sit in the vehicle with the AC running and wait for your treat to be handed to you :O). Honeyman is good about that too :O). Mmmmmmm.. Dairy Queen. Nectar of the gods. 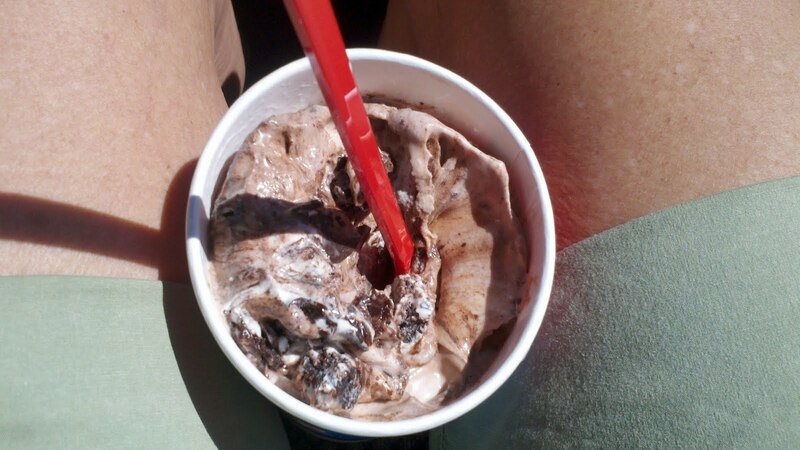 One day we stopped at DQ in our convertible .. kids got Blizzards in the back seat. I was driving. We were cruising along when suddenly a spoon loaded up with Oreo Blizzard came whizzing by my head and splattered on the steering wheel. Son says, "the wind must have blown it." Now we order DQ "to stay." Much cleaner that way. Now that looks good and cold! I always knew that chocolate was a food group onto itself and now the news confirmed it.